The Navy's first aircraft carrier to be built as such from the keel up was also the only carrier that saw action above the Arctic Circle during the war. CBI - China: Day 11 of 154 of the Japanese Invasion of Manchuria. Spain: Day 74 of 985 of the Spanish Civil War. Spain: Day 439 of 985 of the Spanish Civil War. CBI - China: Day 84 of 2,987 of the 2nd Sino-Japanese War. Day 47 of 106 of the 2nd Battle of Shanghai. Day 28 of 70 of the Battle of Taiyuan. Spain: Day 804 of 985 of the Spanish Civil War. CBI - China: Day 449 of 2,987 of the 2nd Sino-Japanese War. Day 110 of 139 of the Battle of Wuhan. Poland: Day 28 of 36 of Germany's Invasion of Poland. Germany and Soviet Union sign agreement to partition Poland. Poland: Day 12 of 20 of the USSR's Invasion of Poland. CBI - China: Day 814 of 2,987 of the 2nd Sino-Japanese War. Day 16 of 26 of the 1st Battle of Changsha. Atlantic: The first of the recently purchased US destroyers arrives in Britain. ETO - UK: Day 23 of 258 of the Blitz. ETO - UK: Day 81 of 114 of the Battle of Britain. East Africa: Day 111 of 537 of Italy's East African campaign in the lands south of Egypt. CBI - China: Day 1,180 of 2,987 of the 2nd Sino-Japanese War. Day 319 of 381 of the Battle of South Guangxi. Day 40 of 42 of the Hundred Regiments Offensive. USSR: The Allied Tri-Power Economic Conference convenes in Moscow to discuss the facilitation of lend-lease supplies for Soviet fighting forces in the war against Hitler's Germany. The American representative promises $1 billion in aid, vastly exceeding what he was authorized to pledge. 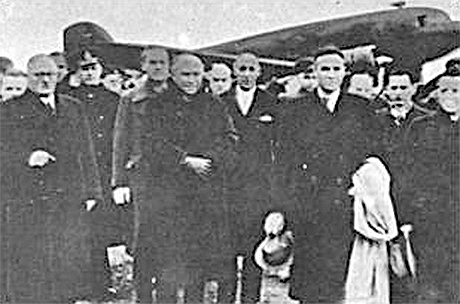 Special envoy W Averell Harriman attended the conference for the US, Minister of Supply Lord Beaverbrook for Britain, and foreign minister Molotov headed the Soviet delegation. W Averell Harriman's promise of $1 billion in aid to the USSR exceeded what he was authorized to pledge and he caught flack for having done so upon his return to the US. But as the wealthy son of railroad baron E H Harriman (whose name you may remember in the 1969 film Butch Cassidy and the Sundance Kid) he used his own money to purchase air time on CBS radio to explain the program in terms of enlightened self-interest. All skepticism vanished after the Japanese attack on Pearl Harbor. Russian Front - Finland: Day 99 of 164 of the Battle of Hanko. The Soviets will be forced off their leased naval base. Russian Front - Finland: Day 25 of 28 of Finland's reconquest of East Karelia in southern Finland. The Soviets continue withdrawing from Finland back to Leningrad. Russian Front - Finland: Day 92 of 142 of Operation SILVER FOX, a joint German-Finnish campaign to capture the Russian port of Murmansk in the Arctic. The German troops continue withdrawing back into northern Finland. Russian Front - Finland: Day 90 of 140 of Operation ARCTIC FOX, a joint German-Finnish campaign against Soviet Northern Front defenses at Salla, Finland. Russian Front: Day 99 of 167 of Germany's Operation BARBAROSSA, the overall invasion of the USSR. Russian Front - North: Day 21 of 872 of the Siege of Leningrad. Russian Front - South: Day 52 of 70 of the Siege of Odessa, Ukraine. Russian Front - South: Day 3 of 12 of the Battle of the Sea of Azov (north of Black Sea). MTO - Libya: Day 172 of 256 of the Siege of Tobruk. East Africa: Day 476 of 537 of Italy's East African campaign in the lands south of Egypt. CBI - China: Day 1,545 of 2,987 of the 2nd Sino-Japanese War. Day 23 of 33 of the 2nd Battle of Changsha. Russian Front - North: Day 386 of 872 of the Siege of Leningrad. Russian Front - North: Day 147 of 658 of the Siege of the Kholm Pocket, USSR lays siege to the Kholm Pocket but the Germans hold out for a about a year and a half. Russian Front - Center: Day 61 of 64 of the 1st Battle of Rzhev-Sychevka, Russia. Though it will end in a stalemate, it will keep German troops from going to Stalingrad. Russian Front - South: Day 93 of 150 of Germany's CASE BLUE, the failed offensive to take the Caucasus oil fields. Russian Front - South: Day 37 of 165 of the Battle of Stalingrad, the bloodiest battle in human history. East Africa: Day 147 of 186 of the Battle of Madagascar. CBI - China: Day 1,910 of 2,987 of the 2nd Sino-Japanese War. PTO - Alaska: Day 114 of 435 of the Battle of Kiska, Aleutian Islands. The US and Canada will defeat the Japanese invaders. PTO - Malaya: Day 222 of 357 of the Battle of Timor Island, a long guerrilla war ending in Japanese victory. PTO - New Guinea: Day 70 of 119 of the Battle of the Kokoda Track. The Australians continue pushing back the Japanese troops. This will become an Allied victory. PTO - Solomon Islands: Day 53 of 187 of the Battle of Guadalcanal. US Navy claims 42 Japanese aircraft were shot down during the past three days, with no US losses. Russian Front - North: Day 751 of 872 of the Siege of Leningrad. Russian Front - North: Day 512 of 658 of the Siege of the Kholm Pocket, USSR lays siege to the Kholm Pocket but the Germans hold out for a about a year and a half. Russian Front - North: Day 3 of 15 of the USSR Kremenchug Offensive into Estonia. Russian Front - Center: Day 53 of 57 of the 2nd Battle of Smolensk, Russia. A Soviet victory as the Axis will be completely cleared from the Moscow region. Russian Front - Center: Day 43 of 48 of the Battle of Bryansk, Russia. German troops continue evacuating the Bryansk area. Russian Front - South: Day 36 of 122 of the Battle of the Lower Dnieper River, USSR. MTO - Italy: US 5th Army prepares for an assault on Naples and Avellino. The RAF, US 9th and 12th Air Forces provide the air cover for the Allied ground troops. MTO - Yugoslavia: German anti-partisan forces retake Split from Tito's partisans. CBI - China: Day 2,275 of 2,987 of the 2nd Sino-Japanese War. PTO - New Guinea: Day 10 of 219 of the Battle of Shaggy Ridge. This will become an Allied victory. PTO - New Guinea: Day 7 of 162 of the Battle of the Huon Peninsula. This will result in an Allied victory. PTO - Solomon Islands: Day 45 of 56 of the Battle of Vella Lavella. The Allies will win this one. 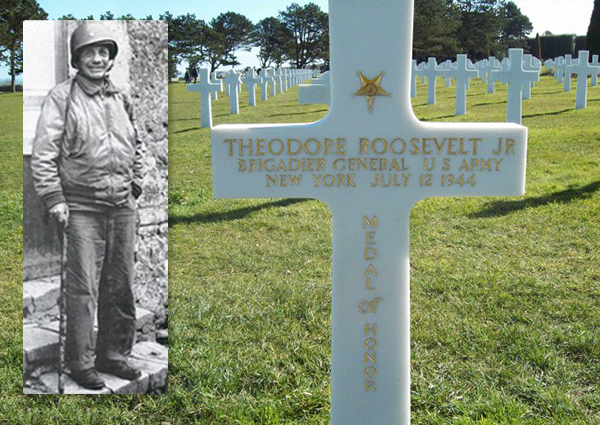 ETO - France: US Brigadier General Theodore "Ted" Roosevelt Jr, who died in Normandy of a heart attack on 12 Jul 44, is posthumously awarded the Medal of Honor. 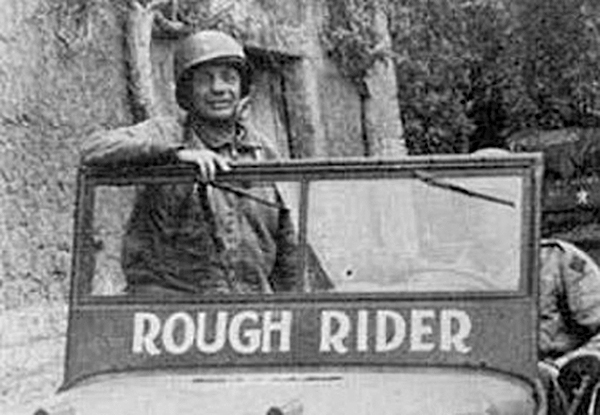 Despite a heart condition and arthritis that forced him to use a cane, Theodore "Ted" Roosevelt III led the assault on Utah Beach at age 56, making him the oldest man in the invasion. He was the eldest son of President Theodore Roosevelt and Edith Roosevelt, and was instrumental in the forming of the American Legion in 1919. He later served as Assistant Secretary of the Navy, Governor of Puerto Rico (1929-32), Governor-General of the Philippines (1932-33), Chairman of the Board of American Express Company, and Vice-President at Doubleday Books, and finally as a Brigadier General in the United States Army. Upon his arrival in North Africa, he was soon known as a general who often visited the front lines. He had always preferred the heat of battle to the comfort of the command post, and this attitude would culminate in his actions in France on D-Day. Roosevelt was the only general on D-Day to land by sea with the first wave of troops. He was also the only man to serve with his own son on D-Day at Normandy (Captain Quentin Roosevelt II was among the first wave of soldiers to land at Omaha beach while his father commanded at Utah beach). On the day of his death he had been selected by General Omar Bradley for promotion to major general. Gen Roosevelt lies buried today next to his brother, Lt Quentin Roosevelt, who was killed as a pilot during World War One. In 1955, the family had Quentin's body exhumed from the Oise-Aisne American Cemetery and moved to rest at his brother's side. ETO - France: Day 59 of 284 of the Battle of Brittany. ETO - Belgium: Day 27 of 62 of the liberation of Belgium. ETO - France: Day 14 of 236 of the Siege of Dunkirk. ETO - Germany: Day 10 of 145 of the Battle of Hürtgen Forest. ETO: US 8th Air Force B-17s and B-24s hit targets in western Germany. Russian Front - Finland: Day 14 of 223 of the Lapland War. Finland and Russia have joined forces to kick the Germans out of Finland's most northern province. Russian Front - North: Day 15 of 41 of the Battle of Riga, Latvia. Russian Front - Center: Day 15 of 72 of the Battle into East Prussia and northern Poland. Russian Front - South: Day 15 of 72 of the Battle of Belgrade, Yugoslavia. After an agreement between Tito and Stalin, the Soviet Army begin an offensive toward the Yugoslavian border from Romania. MTO - Italy: US 12th Air Force fighters run a small scale raid at Bologna. CBI - Burma: Day 181 of 302 of the Chinese Salween Offensive in Burma. CBI - China: Day 2,641 of 2,987 of the 2nd Sino-Japanese War. Day 165 of 259 of Japan's Operation ICHI-GO. PTO - New Guinea: Day 289 of 597 of the Battle of New Britain. PTO - New Guinea: Day 160 of 481 of the Battle of Western New Guinea. PTO - Palau Islands: Day 14 of 74 of the Battle of Peleliu (Operation STALEMATE II). PTO - Palau Islands: Day 12 of 36 of the Battle of Angaur. General George C Marshall, chief of staff of the US Army during WWII, faced the daunting task not only of overseeing two theaters of a global conflict, but also of selecting the best generals to carry out American grand strategy. Whether they came from Sioux Falls or the Bronx, over half a million Jews entered the US armed forces during the Second World War.